For a preschooler, nothing is more exciting than riding his or her first tricycle “like a big kid.” And as long as your child wears their helmet, stays on the sidewalk and has a grown-up supervising them, you have nothing to worry about. In fact, cycling is a great physical activity that builds children’s speed, endurance and coordination. 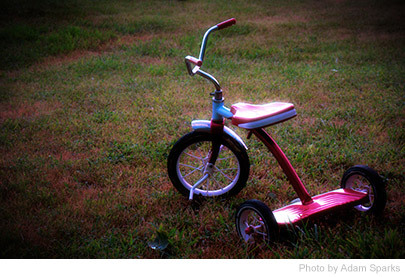 Here are some cool tricycle games for kids to keep the little ones active this summer. For most of these, you can adjust the difficulty level to suit the age group and skills level of your little tricycle riders. So what are you waiting for? Get, set, go! Choose a quiet street in your neighborhood that has little traffic or use a school or church parking lot. Get your tot and their friends to decorate their tricycles with flags, streamers and pinwheels and maybe a dash of glitter and paint. They could even attach wagons to take their favorite toys and dolls for a ride. Invite the kids’ parents, friends and neighbors to line the sidewalk and cheer the little cyclists as they participate in the parade. Play some cool music, blow horns and ring bells as they pass by. Make sure there are plenty of pictures everyone can fawn over later. Next summer, they’ll be clamouring to repeat this fun tricycle game for kids! Don’t let the heat drive the kids indoors – just ask everyone to bring their tricycles and organize a tricycle wash right there in your yard. Set up a ‘center’ where everyone gets to participate in a different stage of the washing cycle. Some kids get to do the ‘rinsing’ – spraying water on the tricycles; some do the ‘washing’ – cleaning the machines with sponges and soapy water; and some man the ‘drying’ stage – wiping the tricycles dry with towels. Cooling off will be much more enjoyable with this watery game for kids! Here’s a fun tricycle game for kids that challenges and hones their gross motor skills and hand-eye coordination. Use orange traffic cones, empty cans, cardboard boxes and sidewalk chalk to create an obstacle course in your backyard. Make sure there are no sharp corners or narrow areas that kids find difficult to negotiate. Watch out for rocks and debris that might trip someone up. When the course is ready, invite the kids to line up their tricycles at the start line and race off at the signal!